I’m really excited to finally share this Slow Cooker Chicken Burrito Bowl recipe. 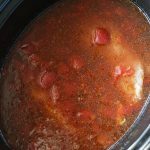 This is the slow cooker version of my popular one-pan chicken burrito bowl. 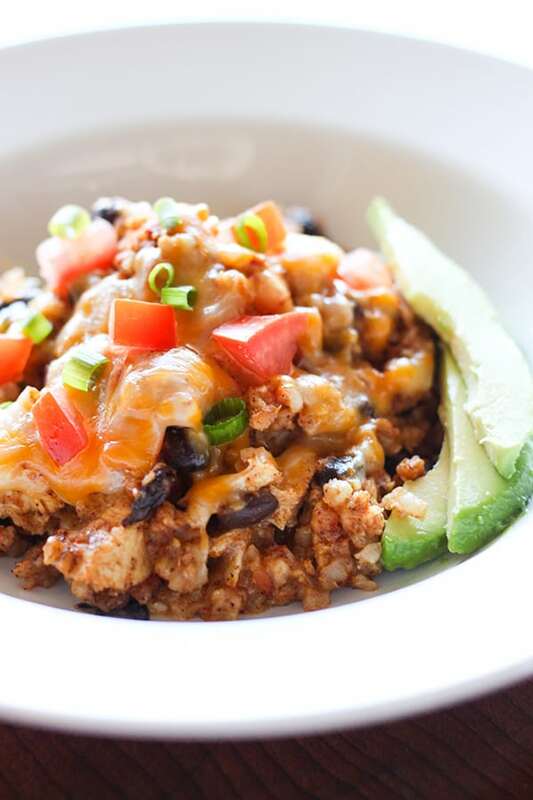 Tender chicken simmered in a flavorful mix of Mexican seasonings combined with tasty black beans and brown rice, and topped with melty cheese, fresh ripe tomatoes and buttery avocados. This dish can be served in a bowl or wrapped in a big soft tortilla for delicious homemade burritos. I’ve ben working on this recipe for several weeks, so I’m thrilled to finally have it perfected and ready to share. I wanted it to be easy and not require any pre cooking. With this slow cooker chicken burrito bowl, you can throw the chicken, broth and seasonings in the slow cooker and go. I also wanted to use brown rice in this version, since so many have asked about using it in my one-pan version. My secret to perfectly cooked rice in this recipe is instant brown rice. Initially, I used regular uncooked brown rice in the slow cooker, and while the flavor was great, the raw rice just did not cook evenly in the slow cooker. Some parts were mushy, while some pieces of rice were still crunchy after hours in the slow cooker. So, I consulted with one of my must have cook books, Cooks Illustrated Slow Cooker Revolution, and found the suggestion for using instant rice. Instant rice is actually partially cooked, and adding it to the mix for the last 30-45 minutes created perfectly cooked brown rice in the slow cooker. 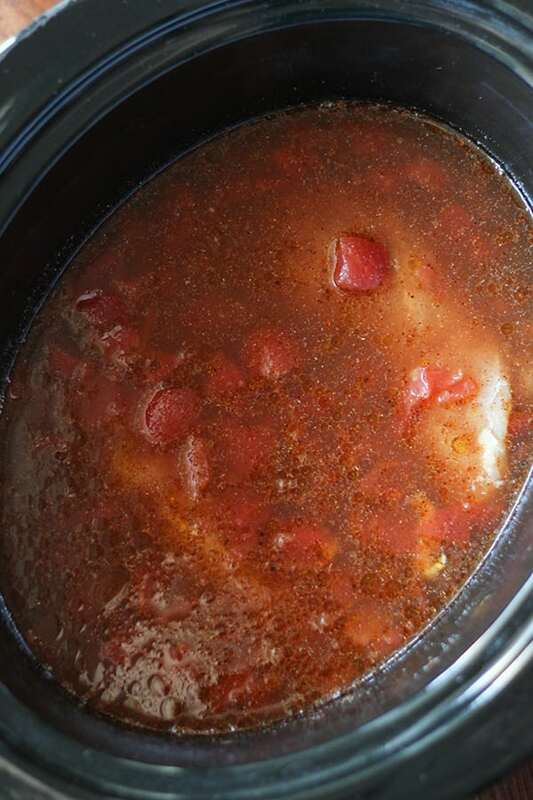 Start by adding chicken breasts, olive oil, low-sodium chicken broth, drained diced tomatoes, and spices to the slow cooker. Once you stir in the spices, you know it’s going to be delicious – the smell is amazing! Let cook on low for about 4 hours. 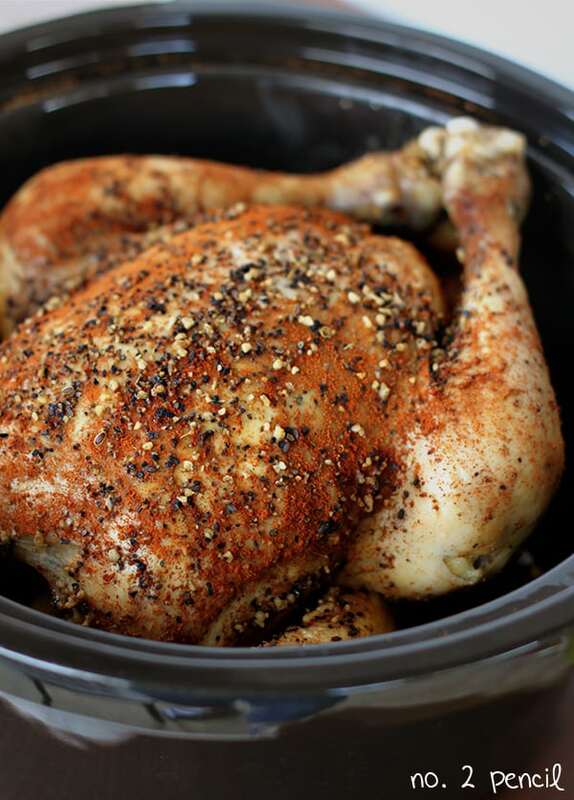 Since slow cooker times vary, use a meat thermometer to ensure chicken has reached 165 degrees. Here is the mixture after 4 hours. Doesn’t it look delicious? It smells even better! Remove chicken and set aside to let cool. Stir in drained and rinsed black beans and instant brown rice. Cover and let cook on high for an additional 30-45 minutes. Once rice is tender, shred or chop chicken and return to slow cooker. Sprinkle shredded cheese on top, cover and let melt. Serve with choice of burrito bowl toppings. I like fresh tomatoes, green onions, sour cream and avocados. This also makes a delicious filling for burritos and freezes well. I’m going to double my next batch and use the extra to make freezer burritos! This is pretty brilliant — and it looks so colorful and fresh, not what I usually associate with slow cooking! Yummy! Would I be able to use bone in skin on chicken breasts? Sure! That would work great! Can I use regular brown rice (not instant) and put it in in the beginning of the recipe? I talk about that in the article above. It didn’t work in the recipe testing. I think that if you don’t want to use instant brown rice, you can use regular brown rice that has been cooked already. 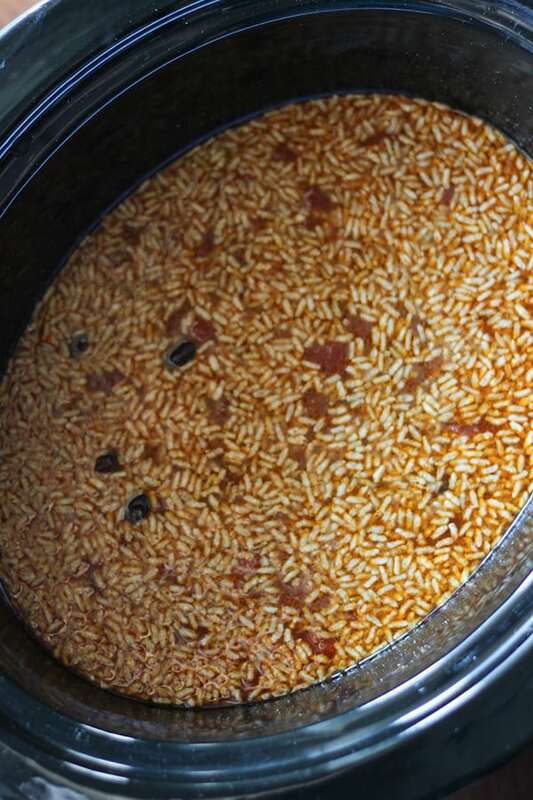 I have a few crockpot recipes that I use that call for pre-cooked rice. I’m not fond of instant rice myself, so I would probably just use the brown rice I cooked on the stove and play with the amount until it turned out the way I want it to. 🙂 (I know Melissa wanted to make this recipe without any pre-cooking, but that’s the only way I see this recipe working with regular brown rice). Thanks for sharing your tip, DeAnn! I’m going to try making this without instant brown rice too. If you’ve done it, can you please let me know what I need to change from the recipe? What should I cut down and by how much? Thank you! Thanks, DeAnn, good to know. I tried that because I don’t like instant. The problem is that the rice is supposed to absorb the liquid so if you cook the rice separately, there is a lot of excess liquid. I use regular brown rice. I add it the last 2 1/2 hours. It works great! Also, I don’t remove the chicken, it stays in and cooks with the rice and I add 2 full cans of broth instead of 3 cups. Looks amazing! Do I put in the chicken breasts frozen or thawed out? Thank you! I used fresh chicken breasts. I just made this and set it to keep warm until dinner time. It looks and smells amazing, and it was absurdly simple to make. I can’t wait to try it! Thank you! I agree, it’s so easy to make I almost can’t believe it has so much flavor! although from the pictures it looks to the chicken has been shredded, the recipe does not call for it. Please explain. It’s not shredded, just cut into bite sized pieces prior to cooking. Hope that helps! Looks amazing! Even better since it’s a wonderful crock pot meal! Love easy cooking! 1. I do not like to use instant rice, so if I used pre-cooked brown rice would I just stir that in after the chicken has cooked and let everything keep warm together? Do I still add the black beans and let them cook for 30 minutes? 2. I would love to add corn to this recipe, can I add it at the beginning or wait and add it with the black beans? I haven’t tried it with cooked rice, but I think you would need to play with the liquid ratios. The instant rice absorbs broth as it cooks. The beans will just need to heat through. Are you adding frozen corn? If so, yes I would add it at the same time as the beans. Hope it works out, thanks for the questions! Hi- this is a great recipe but next time i would consider not draining the tomatoes and even adding some water. It turned out a little dry. That’s how I made it tonight (not draining the tomatoes or black beans) and it turned out amazing!!! I also topped it with some salsa and lime wedges. It’s a beautiful pile of Mexican deliciousness. Thanks for the perfect recipe, especially for a beginner. Made this tonight with quinoa (didn’t have any instant brown rice). Used 1 1/2C quinoa and put it in at the beginning with the chicken and spices. Worked great!!! Just what I wanted to know!!!! looks delicious! If I wanted to freeze this would you recommend not adding the rice and cheese until I was ready to eat it? I froze portions with rice and cheese already added and it worked perfectly, but I think it would work either way! Happy freezing! I want to make this but don’t have time do put it for the slow cooker. Can I just make it in a pot on the stovetop? Thank you so much!! Just made it tonight. Afordable, easy and tasty – perfect!! I added a can of corn for sweetness at the end. My family liked it and probably would have liked it without the corn haha. Found on Pinterest and made according to recipe today. AMAZING dish! Thank you for sharing! This was amazing! My husband hates chicken, but he loved this dish. I was able to use regular (not instant) brown rice by adding only a cup of the rice, then cooking on high for 2 hours. I only used regular brown rice because it’s all I have in my pantry. The spices are perfect, and avocado and fresh sliced tomatoes were perfect on top. Thank you for the recipe! I started making this and realized all I have is regular brown rice also! So did you remove the chicken before adding the cup of rice and cooking for 2 hours on high? i made this tonight and used enchilada sauce instead of the tomatoes…thought i had tomatoes and i didn’t..also just added a taco seasoning packet…this was SO YUMMY!!!!!! and super simple! kids loved it too! thanks for sharing!!! This looks delicious! One question – if I wanted to double the amount of chicken, would it still turn out ok? Wasn’t sure if the recipe called for enough chicken to serve 4 people. Question- would quinoa at the end work in the same way? Instant rice and quinoa have the same cook time and absorbency. Scared to try bc I don’t want to ruin it (chicken is already smelling delish), but don’t have enough rice. Can you use white rice instead of brown? I make this in the one pan version but I use taco seasoning and add corn. It gives it a great Mexican flavor and the corn gives it a nice little kick. Will definitely try in the crock pot. I added 1 can of corn drained, 2 Tablespoons of chipotle sauce & 2 Tablespoons of chopped pickled red jalapeños to the rice as it cooked. Then I sautéed 2 green peppers & 1 red onion. I put that over the rice then the chicken on top of the peppers and onions. If I don’t want to use rice how should I adjust the liquid? Does it even need chicken broth? Recommended seasonings for pork and beef Burrito Bowls? I’m a big fan of Chipotle Restaurants, but with there recent price increases, will make my fillings at home and get more for my money. Trying chicken recipe today. I added a can of corn once the rice was cooked, and stirred in about a cup of salsa. It was delicious! I noticed you said that you cut the chicken into pieces before cooking, but in the photos it looks like it is still two large chicken breasts..I want it cut into smaller pieces but don’t want to over cook it. Did you cut it before cooking it again with the cheese or was it cut from the start? It was cut into pieces before cooking. This made a lot of food and turned out great. We added frozen corn and bell pepper and served it with shredded lettuce, chilula, and tortilla chips. Next time I think I will do less rice as it seemed to mostly be rice and it got a little too dry when the rice soaked up all the liquid. Delicious all around though! Have you tried with quinoa? I haven’t tried this one yet, but I’ve tried it on another similar recipe. I kept the measurements the same, but had to cook a little longer. Let us know how it goes! This was SO GOOD… I absolutely love one pot meals. I put a diced onion in with he chicken while it cooked, and then I added a red bell pepper and a jalepino pepper with the black beans and rice. Served with Greek yogurt and avocado. Delish!!! This looks delicious! i am cooking for 10 tonight, and can’t wait to servei this up! I made this last night, my husband thought it was pretty tasty. He also suggested I add corn next time! Hii, Interesting blog. I have been wondering about chicken recipes, so thanks for posting. I’ll definitely be subscribing to your site. Keep up the good posts. If I’m going to cut this recipe in half, would you suggest the same amount of time to cook? Or make it shorter. Thank you! Easy and delicious! I have made this at least once a month in the last several months. Thank you!!!! If I want to cook on high what is the new timing ? I made this last night and my husband went nuts over it, which is almost the opposite reaction I was expecting. At best, I thought he would tolerate it as he doesn’t care for tomatoes OR black beans. But as we were sitting there eating dinner he said out of the blue “I think you should open a Mexican restaurant and only serve this”. Just thought I would pass the compliment along to you! And just a side note that we ended up putting it into fresh tortillas with sour cream and avocado. So dang delicious. This morning my husband mixed the leftovers with scrambled eggs and added hot sauce for breakfast tacos. 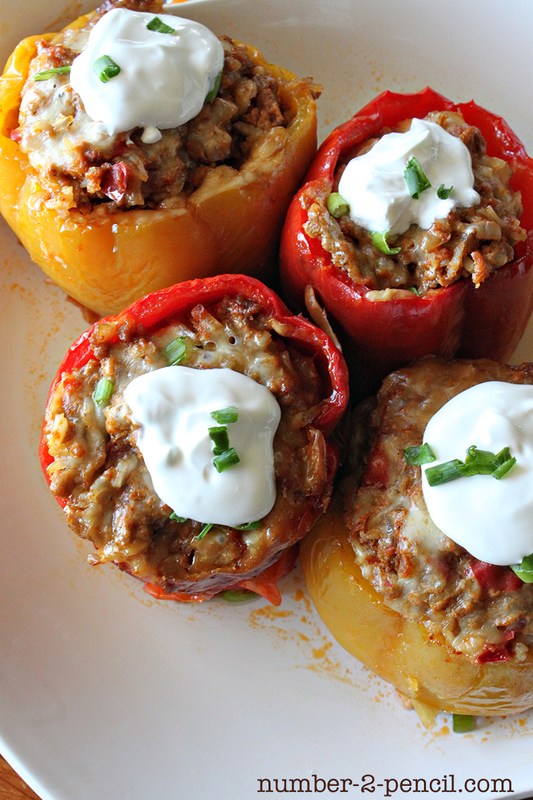 Easy and versatile, the perfect crockpot food! Loooove! I live alone and I halved the recipe. Even then I still had enough for 4-5 meals. Never got tired of it and I even switched it up by putting some of the mix into warmed tortilla shells. So good! Will be making many many times! Very good. I made a couple adjustments based on a similar recipe I found on thekitchn.com: added 1 cup frozen corn with beans last 1/2 hour of cooking, and cooked quinoa separately (since I didn’t have instant rice) and mixed all together at the end. I reduced broth to 1/2 cup since it wouldn’t be absorbed by rice. I think next time I may add an extra can of beans. 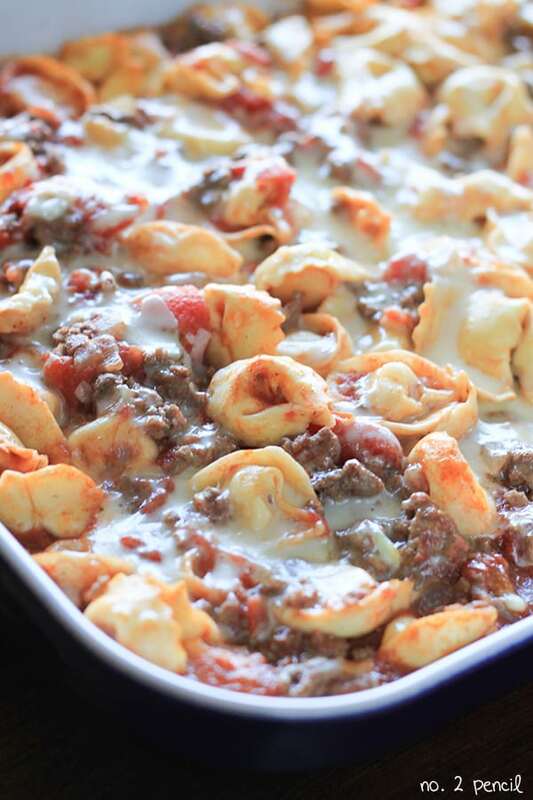 Easy and filling, will be great leftovers too – thanks!! Simple and tasty! After reading the recipe, I knew I just had to spice it up! For all you spicy food lovers, here are my customizations. -I used a can of Rotel (tomato and Chilis) instead of plain tomato. -I skipped the onion powder and added half of a yellow onion diced when I added the Rotel. -To balance out the spice, I also added a can of sweet corn when I added the black beans. -After the rice was cooked, I threw in a cup of loosely packed cilantro, which added so much flavor! -I also substituted a habanero jack cheese. A little squirt of fresh lime and topped with guacamole made this dish perfect and guilt-free without cutting out flavor. Spice level is between a medium and hot. I was wondering if you could use 1 lb. ground chicken browned instead of the chicken pieces? I don’t see why you couldn’t! I have used ground beef and ground turkey in this recipe. Hi this may be a silly question, but do you put the chicken in raw or cooked? This looks so yummy! I made this it was awesome, the whole family loved it. I followed your recipe exactly so I see no need to change cooking instructions. It’s so easy to make, so great job and looking forward to trying your other recipes. This was delicious! Made it for my family and we loved it! I ended up not having instant rice, but made some in my slow cooker. Added it in just before topping with the cheese and it turned out fantastic! Thank you for sharing this recipe! Great recipe! Big hit! It makes a lot, which is good to feed a family and have leftovers. I pretty much followed the recipe exactly, except that I added 4 cups of broth instead of 3 and I shredded the chicken after it cooked for 4 hours and left it in the crockpot and it cooked with the rice. It ended up perfect! Love this recipe and making for the 2nd time. Big family so I use 3 large breast (2lbs). Did not add the rice the first time but served on the side. I shred the chicken before adding back in. Tonight I am trying the rice inside. (Or maybe quinoa haven’t decided..I am a low carber so will use a little less) My whole family raved about it. Thank you! I can’t thank you enough for this recipe!! I’ve made it 4 times! My family loves it, and it’s so easy. Love, love, love this recipe. Our store didn’t have Instant Brown Rice, so I just par-cooked some regular brown rice and then threw it in. It came out perfectly cooked and everyone loved this in our family. Home Run! Thank you! Hi. 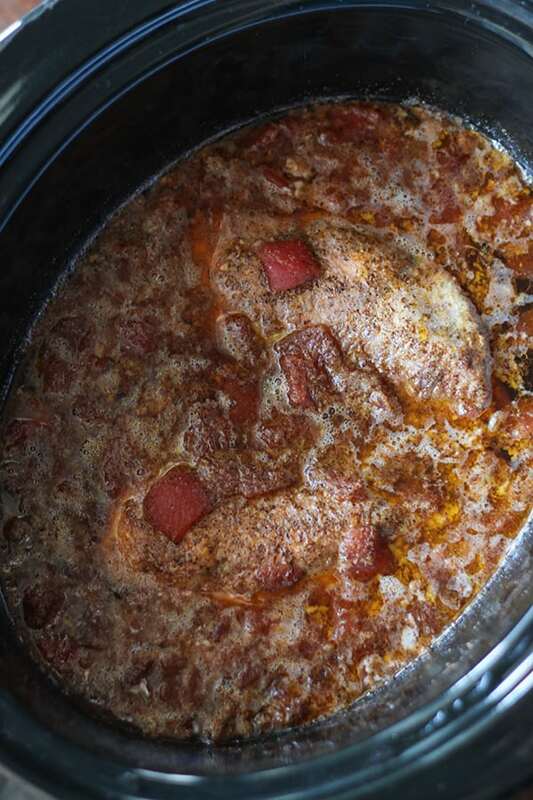 I am wondering size slow cooker use for this recipe? I have a 6 quart and 3 quart. I use a 6 quart! Hope that helps! 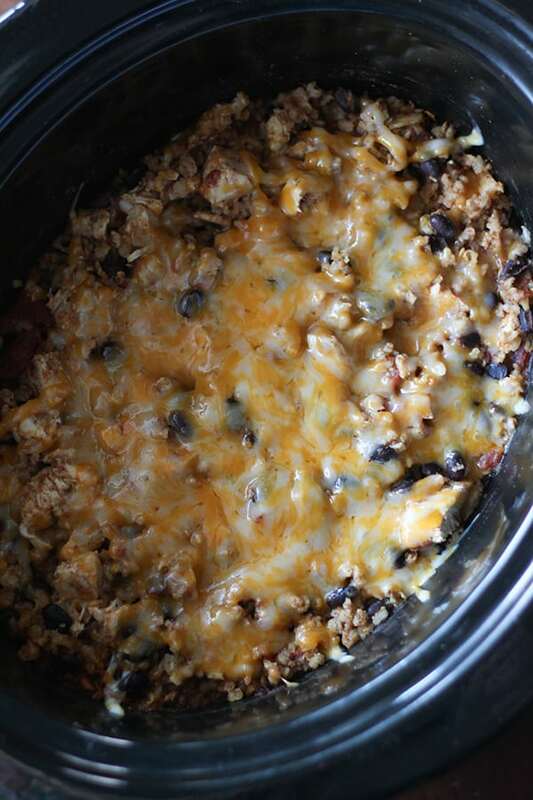 Can I make this ahead of time and leave on warm in the crockpot or will the rice get mushy? I think it will stay warm nicely! Turned out great and the whole family (including picky children) loved it. Great recipe. I just had one box of instant rice and it was enough (just over 2 cups)–I think it would’ve needed more liquid had I used the full amount of rice. I also put in the whole can of tomatoes (didn’t drain them). I added cilantro (in slow cooker and fresh when served). This is going to be a regular meal in our house. Thanks for the great recipe! Thank you for this. I really enjoyed it! The only change I would make is to not drain the can of tomatoes next time. It was just a little dry and the extra juice would have made a difference 🙂 Other than that, I loved it and will definitely be keeping the recipe. Made this for supper. Cooked some Spanish rice seperately from the rest and then added it after. VERY TASTY. Just had to let you know that we make this recipe ALL of the time! Its is delicious and so filling! Thanks again for posting it! I loved this recipe! Super easy and it tastes amazing! Only thing I would do different next time is cook the chicken for a shorter time. It was a little dry. My husband and I love this recipe and I make it often. I do not add tomatoes and leave everything else the same. So easy and delicious! I’ve made this a zillion times!!! No fuss, no muss, husband, kids, and grandkids love it. So many on hand ingredients, and delicious every time. I don’t, and wouldn’t change a thing!!! !